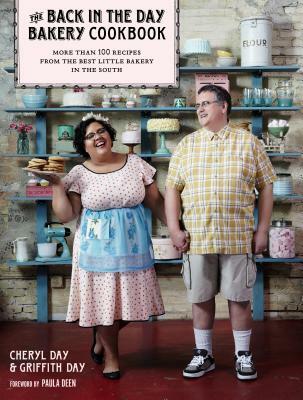 To celebrate the bakery’s tenth anniversary, this duo has written a book filled with customers’ favorite recipes. It’s packed with Cheryl and Griff’s baking know-how plus recipes for their famous Buttermilk Biscones, Old-Fashioned Cupcakes, Chocolate Bread, Cinnamon Sticky Buns, S’more Pie, Almond Crunchies, Drunk Blondies, Pinkies Chocolate Lunch-Box Treats, Rustic Cheddar Pecan Rounds, and much more. Irresistible full-color photographs of food and behind-the-scenes bakery shots will give readers a glimpse into the sweet daily life at the bakeshop. Celebrating family traditions, scratch baking, and quality ingredients, The Back in the Day Bakery Cookbook is like a down-home bake sale in a book. Cheryl Day and Griffith Day are self-taught bakers who founded Back in the Day Bakery in Savannah, Georgia, in 2002. Their latest cookbook, Back in the Day Bakery Made with Love, is a national bestseller, and they were semifinalists for the 2015 James Beard Foundation Award for Outstanding Baker. Cheryl honed her skills in her mother’s and grandmother’s kitchens, and her enthusiasm for enriching lives through the time-honored art of scratch baking is one of her most endearing qualities (along with a few dance moves she picked up in her days as a Soul Train dancer!). Griff’s interest in baking was piqued by the magical sourdough starter that his mother kept in the family kitchen when he was a child. He is a master of flavorful breads and creative savory dishes. Cheryl and Griff got married in their bakery, and the recipe for their wedding cake appears in their first cookbook, the New York Times bestseller The Back in the Day Bakery Cookbook.